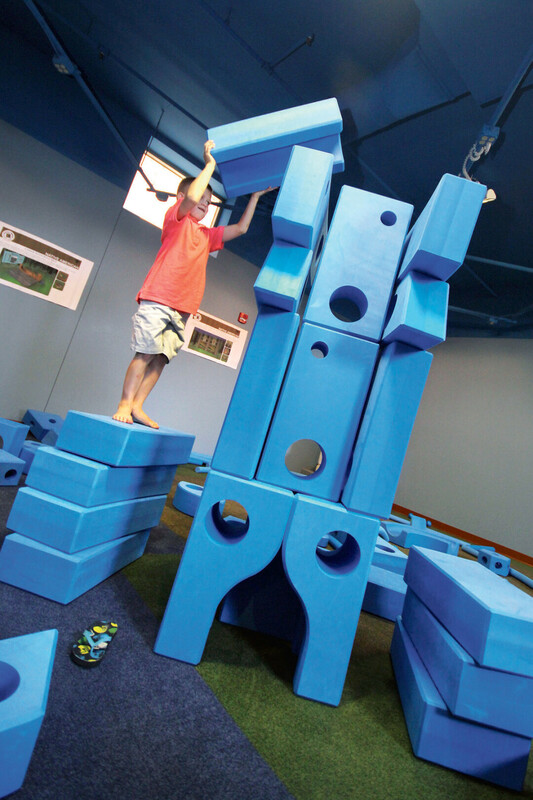 THE IMAGINATION PLAYGROUND AT THE CHILDREN’S MUSEUM OF EAU CLAIRE – A SET OF OVERSIZED BLOCKS – IS GREAT FOR IMAGINATIVE PLAY. For many parents, a new school year means flashcards, homework and shuttling kids to so many extracurricular activities it would make a professional chauffeur blush. Parents of even the littlest children often fret under rising academic pressure for “school readiness” and test prep. But before you pre-register your newborn for pre-school, take a breath and consider the wealth of research suggesting that children who are given the most unscheduled and unsupervised play time are actually the ones reaping the greatest rewards. According to the American Academy of Pediatrics, unstructured, child-driven play is crucial to healthy brain development, helping children solve their own problems, handle emotions like anger and fear, socialize with others, grow a love for learning and develop executive function – the (very important) ability to work independently, set goals and figure out how to reach them. And because play disguises all this development as “fun,” kids don’t even realizing they’re learning stuff! Unfortunately, according to psychologist David Elkind, kids today spend 8 hours less each week playing than their counterparts did two decades ago. Not only does this loss of imaginative play mean kids are less creative and independent, but according to psychologist Peter Gray it also puts them at greater risk for anxiety and depression and for problems with self-control and paying attention. In other words, although it may look like your kids are “just playing,” under the surface they’re hard at work ... er, play ... becoming happy, healthy adults. Play is not a break from learning – it IS learning. In fact, play is so important to optimal child development that the United Nations High Commission for Human Rights named it a right of every child. 1. Let Kids Be Bored! • A child flapping his arms, pretending to be a butterfly. • A child giving his stuffed animals checkups and pretending to be a nurse. • A child using a banana as a telephone. • A child building a tower using blocks. • A child arranging an assortment of cups by size. • A child dropping a toy, picking it up, and dropping it again. • Develops fine motor skills and introduces the concept of engineering. • Promotes problem-solving and creativity. • A child playing hide-and-seek or tag with a friend. • A child jumping onto each sidewalk square. • A child dancing expressively around the room. • Teaches gross motor skills and develops sensory input. • Provides aerobic endurance, muscle growth, strength, and coordination. 3. Be a Team Play-er! It takes practice, but play soon becomes second nature – sort of like riding a (make-believe) bike! As your child’s first teacher, it’s important to understand the need for play in your child’s life. Whether taking a trip to the playground, making up songs during a car ride, or climbing through the giant digestive system at the Children’s Museum, what you do and say when encouraging your child in his or her learning makes a big difference! So remember, kids and grown-ups of the Chippewa Valley: Play early, play often and play on!